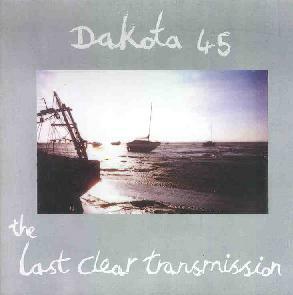 Dakota 45 - "The Last Clear Transmission"
A mostly mellow, and mostly "proper" UK semi-experimental pop/rock band. A few songs are heavy in the sense of British alternarock from the days of the Cure and the Jesus & Mary Chain through bands like Ride & th' Faith Healers on labels like Creation and Too Pure; perhaps American a-rock bands, too - I hear bits that wouldn't sound out-of-place in songs by Pavement, Guided by Voices, Flaming Lips, even Queens of the Stone Age. Some have rather unique & varied synth noises abetting the dynamics. Some are languidly droning through their chord changes. Some tunes are even sweet & fairly catchy in a britpop way. All of the songs have interesting sonics, plenty of dynamics, and a typically nondescript (except when heavily processed), mumbling english singer. If only the songwriting were more memorable, this could be a great album. But for alterna-friendly music which makes for well-constructed & executed, sonically-luscious ear candy, this is a top-notch selection. For more information you can visit the Dakota 45 web site at: http://www.dakota45.com.